Today, I'd like to share a card featuring Magnolia - Tripping Flower Tilda. The papers are from My Mind's Eye - Up and Away paper pad. 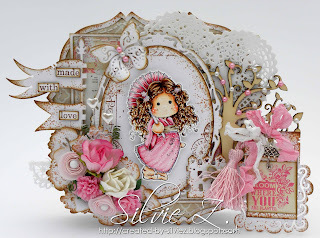 I have also used several Magnolia dies available at Bunny Zoe's Crafts, they are: Lovely Fence, Swirly Butterfly, So Wrapped Tilda Tag, Peonies and Flags. The pretty tree is a Wooden Elm Tree by Kaisercraft. 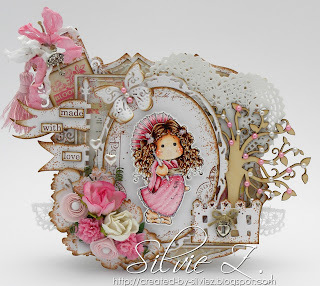 The pink tassel peaking from behind the tag is from Marianne D. - Romantic Tassels pack. I have also added 4mm pink and cream pearls.